Many people do not know the far reaching impact of the incorrect disposal of certain kitchen waste. Disposing of large amounts of fat oil or grease, also commonly known as FOG straight down a drain can cause many issues, starting in your kitchen. This article will help you understand the problems which can occur and how they can be prevented. You can cause yourself a lot of trouble in your home by pouring fat oil or grease products straight down your sink. These sorts of products do not mix with water and other liquids as their components are insoluble. As they cool they will solidify. They will then start to stick to the sides of pipes, slowly building up over time. Other solid items can also get caught up in the FOG like coffee granules or small food particles. This will not only add to the build up and potential blockage, but can start to rot in your pipes and cause bad odors. The smells may then be noticeable in your kitchen or near drains in your garden. This could end up being costly to the householder who will have to get a plumber to sort the problem. I will give you an example of the sorts of offenders you are looking at, I imagine many people may not think about the sort of food that they are cooking and the waste product created. If you cook meat in a tin and you are left with excess fat which is stuck to the metal. Or fry an egg and have excess oil in your pan. You could even drop a chunk of butter on the floor and then wash it down your sink. Businesses in the Catering industry, such as cafes, restaurants and pubs have a legal responsibility to deal responsibly with fat oil or grease waste. The volumes of FOG which are washed down the drain in establishments such as cafes, restaurants and hotels are obviously much greater than in the home. Vast amounts of waste are disposed of daily in certain establishments. They are therefore much more likely to cause major issues at the treatment plants due to the volumes. 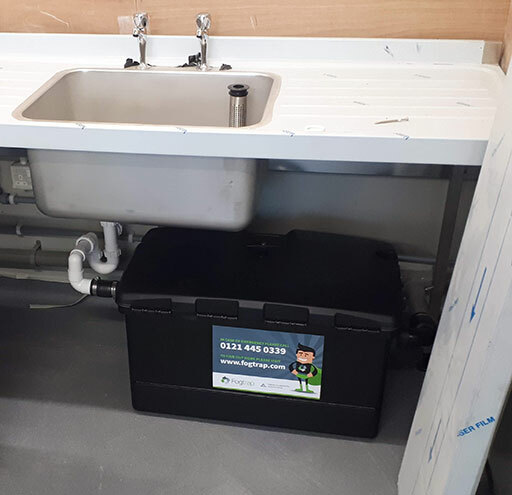 Companies will therefore need to get a FOGtrap or interceptor installed which is fitted in the establishment and will trap all fat, oil and grease within a container, which is hygienically sealed. Many of these disposal companies will also provide a maintenance plan, where they will remove the interceptor unit and keep the area clean. They will then take the waste away with them. The waste can be disposed of responsibly and can even be recycled or used as a renewable energy source. If you do not get problems in your own home or work place, there may still be problems further on. Build up can occur in sewer pipes. This is a big problem for water companies. It is very costly for blockages to be dealt with and this can then in turn impact on households and businesses with water rates going up in price. If the build up becomes too much, this can overwhelm the treatment facilities and raw sewage can overflow and escape into the waterways, causing pollution. Of course the first step to helping with this problem is to put as much of this waste in the bin rather than trying to wash it down the sink. Another tip is to wipe excess where possible with a kitchen towel and then dispose of this into the garbage, which is better than flushing it down a sink. Use a plug hole strainer to stop large particles going down the sink. Collect waste oil in a container, you can then take it for recycling at your local recycling facility. Get a FOGtrap or Grease trap installed. Article written by www.fogtrap.com. Visit our website for more information. Pro-Style Ranges – How Do They Differ From The Other Gas Ranges?